I am looking to make an historic knife, and though I'm familiar with hidden tang examples I'm wondering if any of you are familiar with full tang European knives from around 1200 to around 1400. I was once told by a friend that if you can envision a practical knife than it certainly existed in some form during the middle ages. Before I go and dive in I wanted to be sure. Thanks! There are lots and from about 1250-1400, full tang was more common. Have a look on google for original pictures of medieval eating knives. I'll add that you have only to follow the links in Tod's signature to see the most meticulously researched and beautifully recreated medieval knives available today. You'll see lots of small stuff like detached bolsters and guards that illuminate construction techniques and give good inspiration for designs. one little thing I would add is that there is a distinct transition in the occurrence of full-tang knives during the 14th century. from around the 5th century, in the period after the collapse of the Roman Empire, to the end of the 13th Century, knives in western europe are almost universally of a whittle tang (that is, a stalk-like tang with a one-piece grip bored through lengthways and secured in place.) design, with only a very small number of extant examples of scale construction. the transition to scale construction on a full-width tang with pins starts to take place on mainland Europe somewhere around 1300-1320 and in the british isles 10-20 years later. In the first half of the 14th century, from major archaeological sample sizes a little less then half of knives have scale tangs. after 1350, that rate rises to about 75%, and continued at that rate through the 15th century, and into the 16th C. at that point we see a return to whittle tanged knives from around the 1530's to 40's, where far more whittle tanged knives are used. in the context of civilian knives, that trend continued through into the 18th or 19th centuries before a recurring rise of the scale tanged knife. Well done James, a much fuller version of what I didn't have time to write. It is curious how the design alternates from whittle to scale over and over again - fashion I guess in main part. This is all great info, thanks guys! Tod, your work is amazing by the way. I think what I am going to go for is some manner of Bauernwehr and Hauswehr type knife set. I'm envisioning some kind of larger, single edged blade accompanied by a byknife, and a picker. Would Red Oak and Brass/Bronze be accurate for the guard and scales? 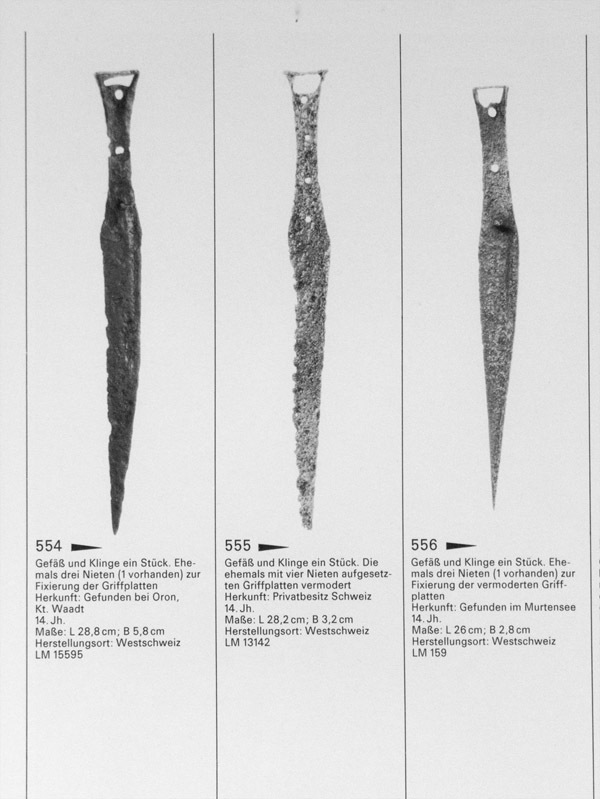 I would be highly cautious of hauswehr, particularly with by-knives if it is for your noted target date - they are very much a 15th-16 century style of knife, which really cant be seen in any archaeological context prior to 1400. there's a tiny sub-set of Bohemian knives from about 1375-1400 (well, to be exact, there is a tiny number of finds in Switzerland, and the Czech Republic, and an abysmal digitisation of lower-end Austrian museum artefacts which make it only conjectural to conclude that they originated in between the two documented find-areas...) which are very similar to early hauswehr in constructional method. I have attached a photograph below. We have almost no evidence for the use of by-knives in that period however, with those really becoming the norm (outside of very specialised hunting trousse sets) in the later half of the 15th Century. For 1200-1400, in general, I am extremely sceptical of the use of hauswehr-like knives in either a military or civilian context. regarding choice of wood, I wouldnt touch red oak; quite simply its a north american timber, so anachronistic in terms of timbers found in Europe. I have generally found only a little evidence for oak or ash in knife hiltmaking in the medieval period - both are coarse-grained timbers which have open pores which rapidly discolour through grime. the most common timber used is european boxwood, Buxus sempervirens; I know from knifemakers in the United states that its a difficult material to get hold of there, however. Its a wonderful material to work with, extremely hard-wearing, tight grained and capable of a beautiful golden-yellow hue. Alternatives, in an approximate order of commonality are Maple, Holly, Yew, or Birch (particularly in Northern Europe). I'd pick one of those long before turning to oak. Regarding choice of metal, I would be inclined to say that brass is a closer analogy to medieval latten than bronze is. Thanks everyone for your input. There is a mountain of knowledge out there that I don't know, and have had very little luck finding. With most research topics I have found professor google to be an excellent source, but not historic knife making. There are simply too many inaccurate reproductions out there to trust the search. I began this journey into historical knife making a couple of years ago, and have been working at it on and off. Then I get distracted with modern knife making for a while, and ruin a bunch of 5160 by trying to grind a secondary bevel. This can be an incredibly frustrating hobby, but I will keep at it until I figure it out. For now I want to concentrate on historic models at least partially because they seem to lack the "plunge line" of modern knives. Also, I first got into the hobby to make historical stuff, and that's where my passion really lies. I ordered the book suggested above, and expect it to show up soon. Thanks again, you all are an incredible resource. I don't know if you're aware of it, but many other online forums out there are not particularly friendly places to ask for advice. We have almost no evidence for the use of by-knives in that period however, with those really becoming the norm (outside of very specialised hunting trousse sets) in the later half of the 15th Century. Interesting! Francesco Datini carried sets of 3 or 4 knives (coltelli), cleavers (coltelle), and little knives (coltellini) in a single scabbard "for table" and "for serving" from the 1360s onwards. But those probably lived in a chest in the kitchen or the hall, and I don't know how people grand enough to wear a dagger carried their eating and working knife during his lifetime. The paintings I have seen of swords and big fighting knives with a little eating knife in the same scabbard are later, just like you say. Those combined scabbards are clever and would probably be fun to make. Yes, that's definitely one of the first quotes on the subject of them. there's a handful of hunting trousses from the 14th C which survive, but most seem to be paired large knives, (like the KHM examples D 198 - https://www.khm.at/de/object/780a5b78a6/ , which are notable as they're whittle tang structures, rather than a messer-like full tang. ), rather than combined sets. Which is decidedly frustrating. Hopefully, someone will find good archaeological evidence of such sets into the mid-14th C and we can push the date back a little at least, with more certainty. there's also the lovely set in the british museum with a pair of by-knives, which sort of indicate the developmental sequence going on there too. there's a definite trend in those scabbards in the 2nd half of the 15th century, - particularly when it comes to messers, which is of course where I dived into the rabbit-hole of looking at the data, but I've yet to find a huge body of evidence in the 1st half of the century when it comes to swords or the likes. That said, In many ways, I'm becoming less and less convinced by the concept of the "eating knife" set comprising of a knife, and a pricker/awl. I suspect that's something of a reenactorism, though Tod may well have a difference of opinion on there from his research, and I'd love to hear his thoughts on that. I've seen one example of a paired set, in the PHD work of Zachovsky, but otherwise there's almost a notable absence of evidence for them as far as I've seen - the MoL scabbards, for example are consistently single-blade structures. those in the dublin catalogue are earlier generally, of course. By-knives in larger sets - by-knives with awls in waidpraxe, or trousse seem to be quite commonplace, but not in individual pairs. I am not sure what the basis for putting a pricker and a knife in the same sheath is either, or what they called those little pointy tools. I have a pricker/awl/little pointy thing because the price was right, it is great for eyelets, and it does not have a barcode stamped on it like my other awl. TLIO has one of these sets of knives in 1266, although it does not explicitly mention that they were in the same scabbard. But I think that when people interested in material culture start reading Italian, they will find that a lot of stuff which they thought was new in the 15th century was actually around in the 13th. Castello Boxwood (Calycophyllum multiflorum) is readily available in the USA, and is a suitable substitute for European Boxwood, albeit it is slightly softer than B. sempervirens. As a matter of fact, you can often get Castello Boxwood in pieces larger than you can get with European Boxwood.